Salty water kills single-cell organisms such as mold spores by dehydrating them. But you must keep the area around the organisms wet, paradoxically, for the dehydration process to proceed. This works best on small food and clothing items that you can wrap with a cloth saturated with saltwater. A pile of salt of a piece of slate. In an environment of salt water, a mold spore is in the same situation as a person on a lifeboat on the ocean -- all the water around it is poison. Unlike the person in the lifeboat, though, the mold spore has no choice but to drink. Salt water contains a lower concentration of water molecules than fresh water, and to achieve equilibrium, water molecules flow through the spore membrane, killing the spore by dehydration. 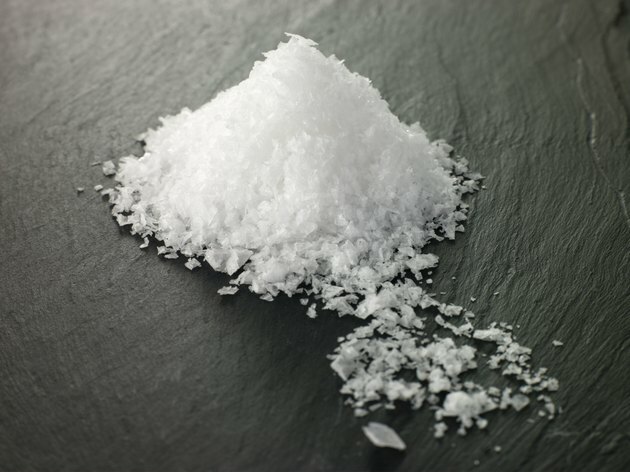 By itself, salt is only effective against mold if the environment around the mold is wet enough to keep the salt in solution. Dusting salt on the floor isn't likely to have any effect on the mold living there, but spraying a salt solution and keeping the area moistened with saltwater will. Salt is corrosive, though; it damages wood finishes and hastens degradation of metal, so it isn't the best natural mold treatment available. Can Mold From Bread Kill You?